An interesting but poorly written early Spaghetti Western from Ferdinando Baldi, starring Franco Nero. Anchor Bay R0 USA disc. 1966 was a big year for the Spaghetti Western. At the beginning of the year, a lone coffin dragging anti-hero became a success across Europe as Sergio Corbucci introduced Django – a character who would inspire almost a decade of violent anti-heros and muddy/gritty westerns. A month later, Lucio Fulci's Massacre Time brought new levels of violence to the Old West. Later in the year, Texas, Addio was released, a more traditional American storyline was accentuated with the strong violence and a 'south of the border' setting of the Euro-Western. All of these films had one thing in common, Franco Nero as the sharpshooting lead. The film opens with a frantic shootout in a small town, two gunmen run around the buildings as shots fly. We meet Sheriff Burt Sullivan (Franco Nero) as he shoots the weapon out of one of the gunmen's hands. Although he lets the gunman go free, the shooter returns shortly to ambush Sullivan on the trail, leading to an old-school Western gunfight on a rockface. Bert makes short work of the gunman after he makes an unforgivable error and leaves his cover. In quick succession: we meet Bert's younger brother Jim; Bert announces he is heading off to find Cisco Delgado, the man who many years previously had killed their father, and bringing him back to Texas for justice; Jim begs to go with him and Bert relents. The brothers head down across the border. There they discover that life is brutal and cheap, and rapidly make some violent enemies. In time they track down Delgado but discover something shocking that makes the revenge they sought much harder to carry out. Along the way Bert aides a revolution, and Jim learns some valuable life lessons. 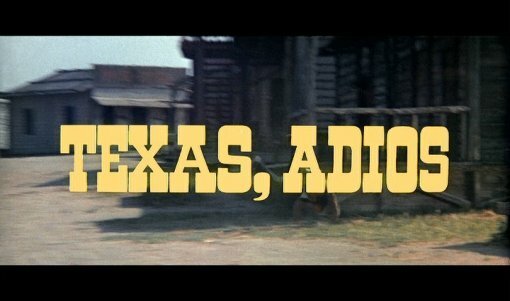 Texas, Addio is a very mixed bag - the general plot of the film is solid, it is a slight twist on the standard revenge piece, nothing spectacular, but it holds up well. However, on closer inspection the script has some flaws – mostly missed opportunities. It is merely a couple of minutes before Bert and Jim are heading off to Mexico, not nearly enough time to build a character – we know that Bert is quick with a gun (and accurate in the way that only a Spaghetti Western anti-hero can be), but little else. This lack of characterisation continues throughout the film. Jim is generally shown to be naive and inexperienced, but when it comes to shooting, he is pinpoint accurate. After an early shootout, Jim confesses that it is the first time he has killed someone, but this fact hardly seems to register. The story could have been much improved if Jim had started off unable to kill a man, let alone hit him but been forced to learn fast by the continual attacks. The 'big twist' has little impact on the audience because we barely know the characters it affects. In all, another half hour of character building could have done the film good. A revolution subplot gives the film its biggest gunfight as a swarm of revolutionaries take on Delgado's troops, with some help from Bert, although this sequence, as well as a dry riverbed shootout seem to be tacked-on to provide some big gun battle moments, and do nothing to further the main storyline. Franco Nero described the film as the most American-style Western he starred in, indeed had it replaced the large gunbattle scenes with characterisation it would not only have passed as an American Western, but been a much better film. The most positive aspect of the production has to be the look of the film, this is aided by a scope widescreen that is used to the full throughout the film, and some beautiful Spanish locations. While the shootouts are pretty standard affairs, with horsefalls and balcony tumbling in large supply, the fistfights are quite distinctive. They were shot with stuntmen who often employ professional wrestling moves (watch out for a 'backbreaker' and 'scoop and slam') but are awkwardly edited – frequent switches to different camera angles are jarring and the lack of music makes these sequences unimpressive. They certainly pale in comparson to the the PoV camera fights in Django (1966) or even the fights in Ferdinando Baldi's later Viva Django (1968). As expected, Franco Nero looks very good here - not as gritty or grizzly as his Django portrayal, he looks convincing throughout. The young Alberto Dell'Acqua as his brother Jim is rather let down by the script and never really gets much to do but looks decent when he gets a chance to act. Various familiar faces crop up throughout, including Luigi Pistilli (Milano Calibro 9 (1972)) and Gino Pernice (the earless Jonathan in Django (1966)). Overall, the film, despite its flaws, is watchable and passably entertaining, mostly thanks to Franco Nero and some big gunfights – although it reeks of missed opportunities that could have made this film a notable genre entry. Baldi would later take the plot focus of this film to make the more effective Il Pistolero dell'Ave Maria (1969). Anyone famous in it? Franco Nero - One of the best Spaghetti Western anti-heros, from Django (1966) to Keoma (1976). Directed by anyone interesting? Ferdinando Baldi - the Spaghetti Western debut of this occasional Euro-cult director, who also directed the superior Viva Django (1968) and the bizarre Blindman (1971). Any violence? Quite a lot of gunfights, no blood. Some distinctive pro-wrestling style fist-fights. Of interest to Spaghetti Western fans but not for new comers, there are many far superior films to choose from. Good soundtrack? Typical ballad-like Spaghetti Western title music, average music throughout. The image is good but with some noticable print damage: large amounts of grain are present and some scenes are quite soft. It is never unwatchable though. Audio English and Italian language - Dolby digital mono. Sound fine although neither sync up perfectly. On screen biography of Franco Nero. Packing Availabe in a Standard Amaray case or in the Once Upon a Time in Italy boxset. Other regions? Region 0 British release, doubled with Keoma. Region 2 Germany, Scandinavia and Japan. The Japanese release also carries an interview with Ferdinando Baldi, but is non-anamorphic. Cuts? The film is believed to be fully uncut. Titles and credits are in English although the film does not carry US title. A watchable and interesting film, but it could have been much better with a more carefully written plot. Decent release, the film is watchable although often very soft. Inclusion of Italian audio track is good, Franco interview is worth seeing. DVD Rewind - DVD release comparasons. Find reviews of our other films directed by Ferdinando Baldi or starring Franco Nero. All text in this review written by Timothy Young - 15th Jan. 2006.